Birks, Melanie, and Mills, Jane (2011) Grounded Theory: a practical guide. Sage Publications, London. This is a highly practical book which introduces the whole range of grounded theory approaches. Unlike most existing books in this area, which are written from a particular philosophical standpoint, this text provides a comprehensive description of the strategies and techniques employed in this methodology. 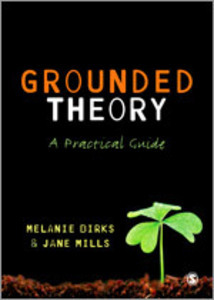 Birks and Mills accessible and highly-readable text is driven by practical case examples throughout to help the reader get to grips with the process of doing grounded theory analysis for themselves. The book deploys a variety of educational activities to guide readers through both the principles and the application of grounded theory, making this an ideal starter text for those new to the approach. This is an ideal first introduction to grounded theory for any student or researcher looking to use grounded theory approaches in their analysis for the first time.